After breakfast at the hotel, we drive to the north of Amman to explore the 12th century A.D castle in Ajloun. Though looking like a Crusader fortress, it was actually built by the Muslims in 1184 as a military fort and to protect the region from invading Crusader forces. We will then continue to the Ajloun Forest Reserve to hike the Roe Deer Trail. This 2km trail takes about an hour and can be self-guided. It starts from the accommodation area, looping over a nearby hill – past a 1600-year-old stone wine press and lots of spring wildflowers. After, we drive to Jerash, so well preserved that you can almost hear the banter of the merchants and the creaking of chariot wheels along the cobblestoned streets. With a 2 hour guided tour, explore the breathtaking arches, temples and baths in an amazing state of preservation and completeness. Next stop is Umm Qais perched on a splendid hilltop overlooking the Jordan Valley and the Sea of Galilee (Lake Tiberias). Site of the famous miracle of the Gadarene swine, Umm Qais, in earlier times know as Gadara, and was renowned in its time as a cultural centre. It was the home of several classical poets and philosophers, including Theodorus, founder of a rhetorical school in Rome. It also boasts impressive colonnade streets, vaulted terrace and the ruins of two theatres. At the end of the day, we return to Amman for dinner and overnight. Breakfast at the hotel, meet our driver and drive early morning to the east of Amman to visit, Qaser Amra: It was built as a bath house and its existence adds to the theory that these ‘Desert Castles’ were built mainly for leisure and not as forts. After that, we drive toward Shaumari Reserve and go on a safari tour for about 3 hours to explore the reserve and the wildlife. We then continue to Al Azraq Wetland reserve and explore the various wildlife Continue to visit Qaser Al-Azraq. The copious springs in the oasis of Azraq made this fort an attractive place for settlement. It is built entirely from local basalt stones. At the end of the day, continue to Madaba for dinner and overnightin 3* hotel. Breakfast at the hotel, then we will visit the St. George Church from the 6th century A.D and explore the mosaic map of the Holy Land Map. After a short drive, we arrive to Mount Nebo to retrace the steps of Moses and admire the spectacular view of the Promised Land just as he did over 2,000 year before. It is very easy to feel that you have arrived some place special. On a clear day Jerusalem, Jericho and the Dead Sea can be seen. A memorial in Moses’ honor can be found at the entrance to the early Byzantine Christian church where Moses is believed to have died. Next stop, Kerak, to visit the 12-century Crusader castle built over the remains of earlier citadels, some which date back to Nabataean times. The castle in itself is more imposing than beautiful, although it is an impressive example of the Crusaders' architectural military genius. Wander through underground corridors with huge kitchens, stables and sleeping quarters with several floors. The top of the castle offers magnificent views in all directions. We then continue to Dana for dinner and overnight camping at Al Rummana Campsite. Breakfast at the camp then meet our local guide to go for a guided hike on White Dome Trail in Dana. Dana is Jordan's largest nature reserve and includes a variety of unique terrain ranging from sandstone cliffs over 1700m high to a low point of 50m below sea level The trail, which is about 8 kilometers, follows the huge escarpments of Wadi Dana between the Rummana Campsite and Dana Village. Passing through terraced gardens, the trail offers breathtaking views of the wadi. After the hiking adventure, we drive to Shoubak to visit its famous crusader castle, perched on top a small hill. Within the fortress, lies great insight into how the day-to-day living must have been during this time. There are ruins of two churches, cisterns and rainwater pipes, in addition to millstones for pressing olives. A set of stairs cut into the rock tunnels down 375 steps to a spring below. We end the day in Little Petra with dinner and overnight camping at 7 Wonders Bedouin Camp. Breakfast at the camp, then begin the day exploring the legendary Rose Red city of Petra. 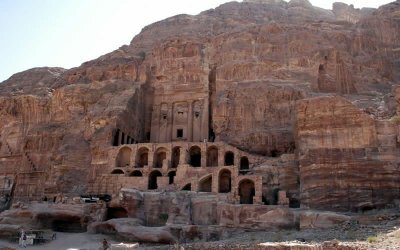 This city of the Nabataean’s was built over 2,000 years ago and lays hidden in a huge rocky mountain accessed via a high and narrow gorge. With monumental facades and spectacular buildings sculpted out of solid rock, this breathtaking site has been described by UNESCO as "one of the most precious cultural properties of man's cultural heritage," and also one of the New 7 Wonders of the World. We will arrange your entrance fees and hire for you a private English speaking site guide to explore the main attractions of the lower part of the city for 2.5 to 3 hours. You and the guide will start from the main gate all the way through the Siq to visit the Treasury, Street of Facades, the Theatre, all the way down to the Nympheom and Qaser El- Bent. You then have some free hours on your own to explore further. After, return to the main gate to meet our driver and return to 7 Wonders Bedouin Camp for dinner and overnight. Today, breakfast at the camp, our driver will take you to the Neolithic village of Beidah (Little Petra) and explore the thousands of years ancient built houses. 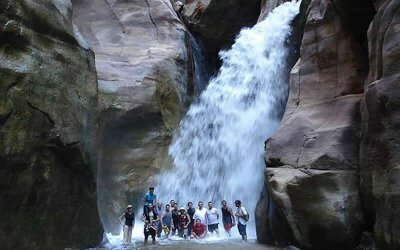 We will also do some mild hiking to visit the Siq Al Braid area and the ancient caves used during Nabataeans time. After, we head to Wadi Rum, where we will enjoy a 3 hour 4x4 safari and explore some parts of the main attractions of the desert, ancient inscriptions, and enjoy driving over the sand dunes. After, we head to the camp for dinner and overnight camping at Caravans Campsite. Breakfast at the camp, then explore the desert landscape as the Bedouin have for centuries - by camel! During your 2 hour trek, get an up close and personal view of the desert. After, we transfer you to Aqaba the only sea port in Jordan. We will arrange a visit to Aqaba Bird Observatory where you can view the various birds in Jordan in their natural habitat. After, we continue into the city of Aqaba where you will have free time to explore. Dinner and overnight at 3* hotel in Aqaba. Breakfast at the hotel, then we will continue to Wadi Mujib Nature reserve for a guided hike on the Ibex Trail for 2 to 3 hours. 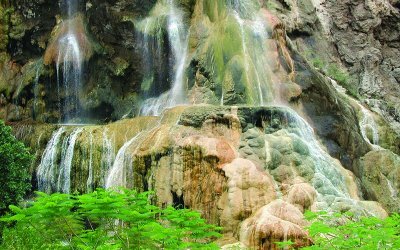 The trail begins at the Adventures Center and follows the Dead Sea Highway before ascending into the reserve. Diverging to the south, the trail runs parallel to the Dead Sea, which provides a startlingly blue backdrop for the entire hike. The hike then continues along a number of dry wadis to the Raddas Ranger Station, where you may see Nubian Ibex. It is also where the famous rock “statue” of Lot’s wife can be seen. After resting at the station, the trail continues along a road for about one hour until reaching the reserve entrance near the Visitors Center. After the hiking adventure, we continue to the Dead Sea for dinner and overnight at 3* hotel.